I’ve made a lot of ugly cakes over the years. They always taste great, sure, but the whole layers thing has always been a bit of an issue for me. Do you have any idea how much cake you have to cut off to make them level?? It just seems like a waste, really. And so I end up with crooked cakes that fall apart almost as soon as I ice them. Fortunately everyone is always just happy to have cake, so it’s not like it’s ever been a huge issue, but it’s something I wanted to work on. So last week I made a triple-decker birthday cake for my friend Jen, and I was determined to get it right. Which I did. More or less. 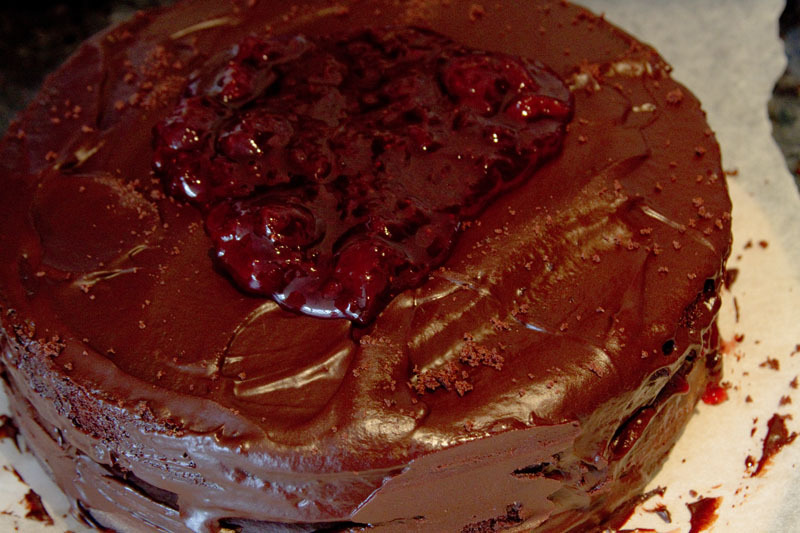 It’s a decadent cake: rich and chocolatey, with dark chocolate ganache and strawberry jam between the layers, and the whole thing coated with my favorite (Magnolia Bakery) chocolate buttercream. Yum. Fair warning: this is pretty involved. It’s a three-layer cake, it’s supposed to be involved. I’ve tried to explain the process as thoroughly and clearly as possible without getting hopelessly boring. So here goes. 1. Preheat oven to 325 degrees Fahrenheit (roughly 160 Celsius). Butter three 9-inch cake pans (mine measured 23 cm, which I’m pretty sure is standard in this country). Line the bottoms with a circle of baking parchment and butter the parchment. I also coated the pans in a light layer of flour, just to be safe. 2. 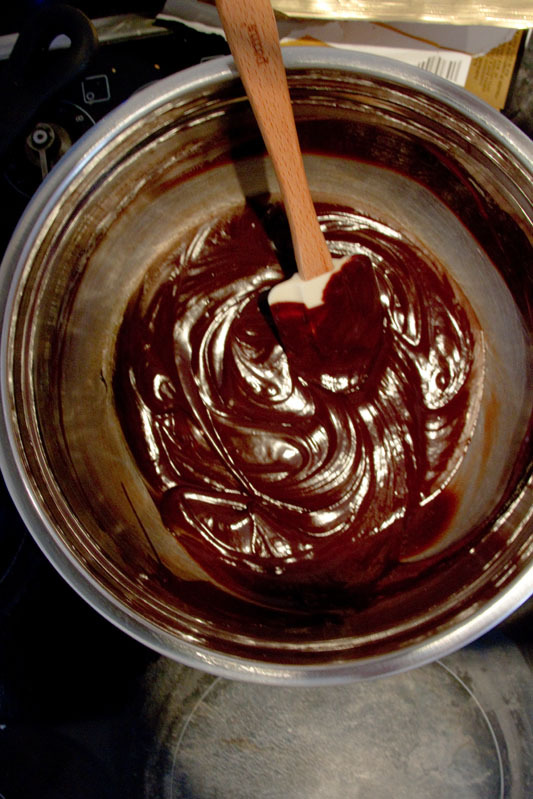 In a medium bowl, whisk together the flour, cocoa, baking soda, baking powder, and salt. Set aside. 2. In a large bowl, cream the butter and sugars until smooth and fluffy. 3. Add the eggs one at a time, beating until well-combined after each. 5. Add the dry ingredients and the buttermilk and vanilla in alternating thirds, mixing until just combined after each addition. 6. 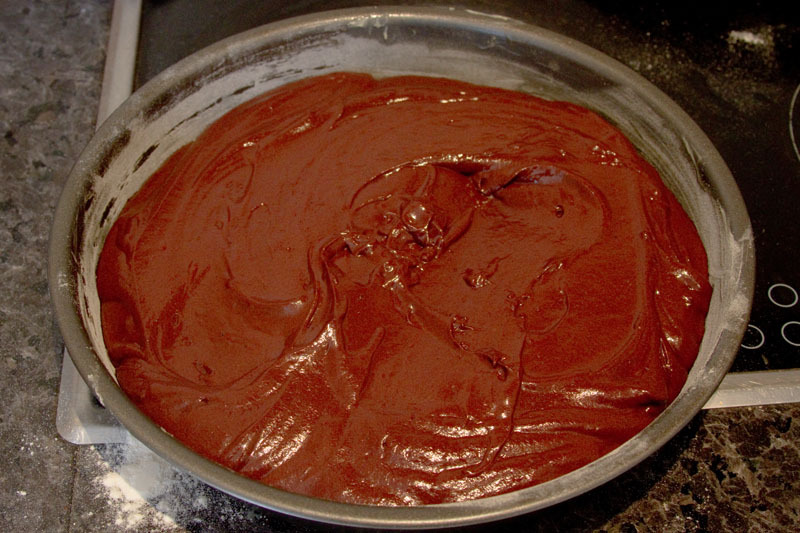 Divide the batter evenly into the prepared cake pans and bake until a tester comes out clean, about 25-30 minutes. Let cool in pans about 10-15 minutes, then transfer to racks to cool completely. I also froze these before I constructed the cake, just because I find them easier to work with. If you want to do that, peel of the baking parchment and wrap thoroughly in cling film and lay the layers down flat in the freezer. They’ll keep for weeks. 1. 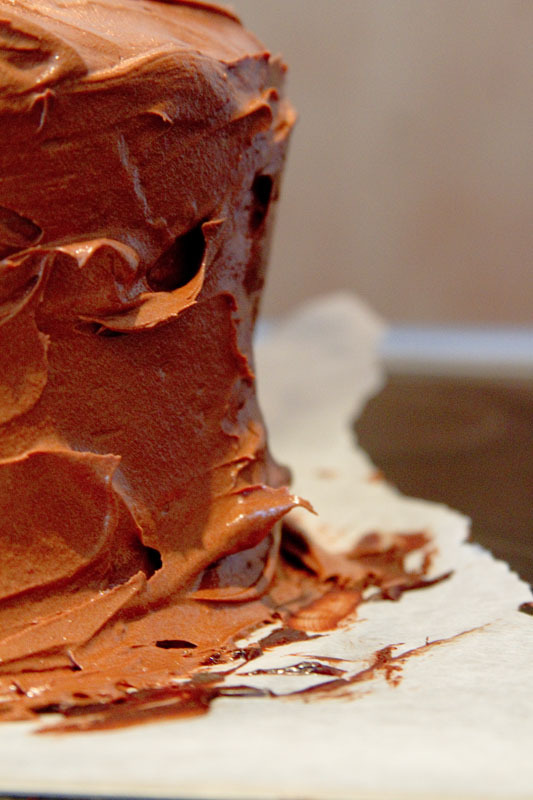 Once the cake layers are good and cool (or frozen), make the ganache. Place the chopped chocolate in a large bowl. Bring the heavy cream just to a boil, either in a saucepan or in the microwave, then pour over the chocolate. 2. Let it all sit for about a minute, then stir with a rubber spatula until smooth. If it starts to cool and there are still hard chunks of chocolate in the mixture, I just put the bowl over a saucepan of boiling water and melt the whole thing. It will take longer to cool down before it’s usable this way, but at least it’s smooth! 3. 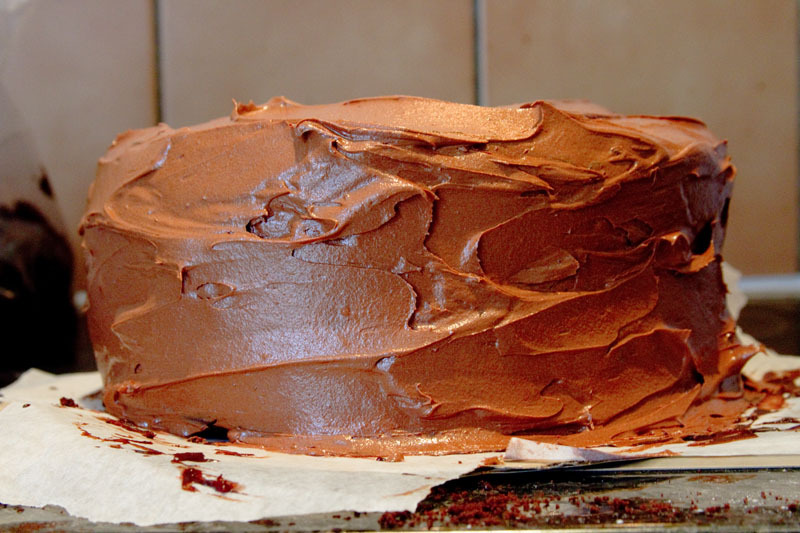 Once the ganache has cooled to about lukewarm, you can start building your cake! Take the first layer out of the freezer and cut it until level. Ms. Smitten Kitchen explains this process better than I could, and gives better advice, so I’ll just refer you to her. 4. Spread a little less than a third of the ganache generously over the top of the first layer. I went ahead and coated the sides lightly as well, because why not. Chill again until set, then spread about 1/3 cup strawberry jam over the top. 5. Repeat with remaining layers, stacking them carefully as you go. The top layer doesn’t get any strawberry jam, but I gave it a thin layer of ganache so it didn’t feel left out. 1. 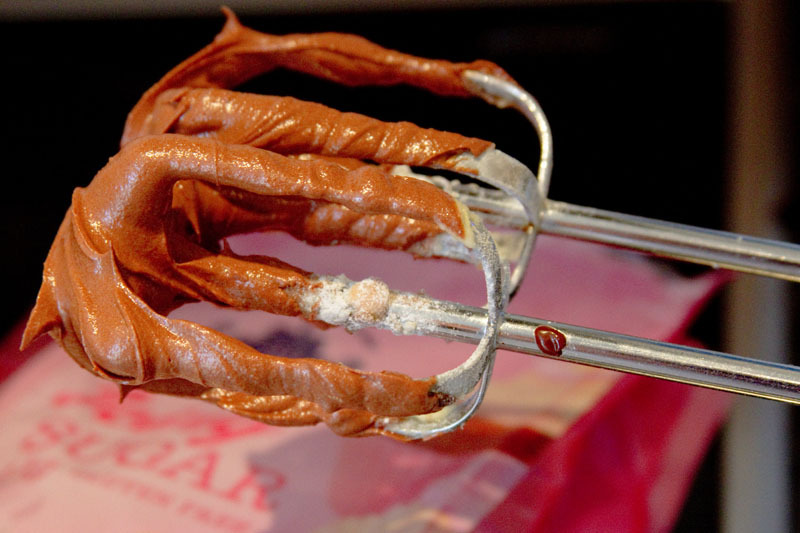 Melt the chocolate, either in a double-boiler or very carefully in the microwave. Set aside to cool. 2. In the same bowl with the leftover ganache, beat the unsalted butter until smooth and fluffy. Add the milk and carefully beat to combine. 3. When the chocolate is lukewarm or cooler, pour it into the bowl and beat until well-combined. Add the vanilla and beat again. 4. Add the sugar and beat until nice and fluffy. 5. Generously coat the whole outer layer of the cake. I’m not all that sophisticated, so I just used a rubber spatula and as a result my surface was a bit uneven…not the best if you’re planning to decorate, but otherwise not an issue.